It's a race to the Trailhead! 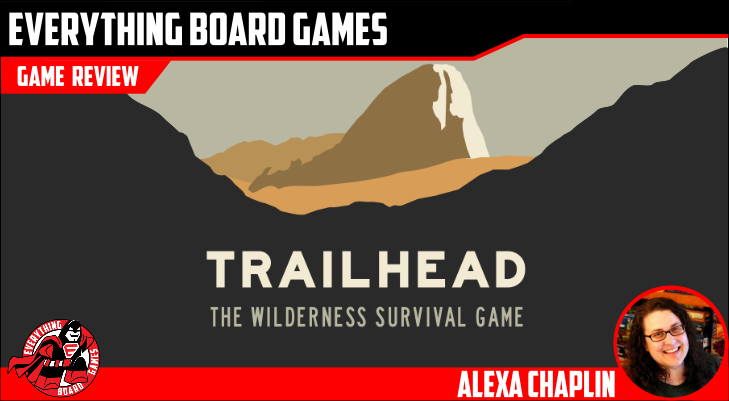 Lost in the wilderness and running low on water, your goal is to be the first player to reach the trailhead. 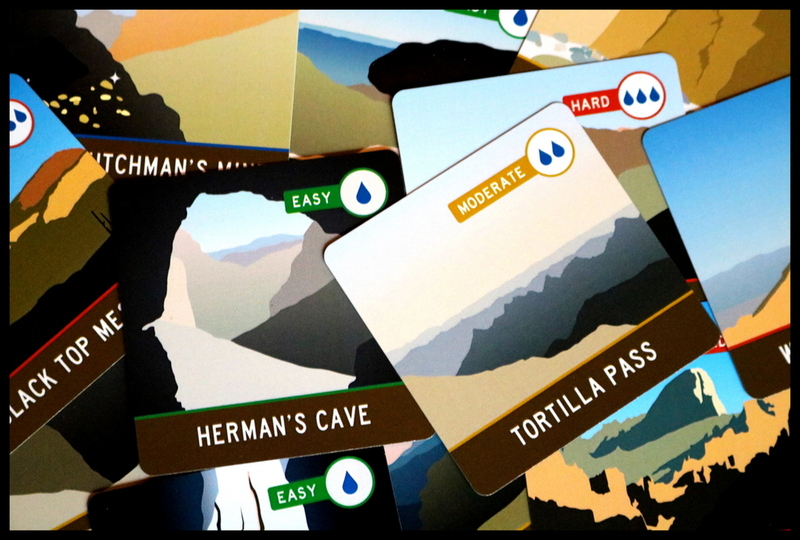 Collect Trail Markers to move forward, but watch out - you lose water at the end of every turn! 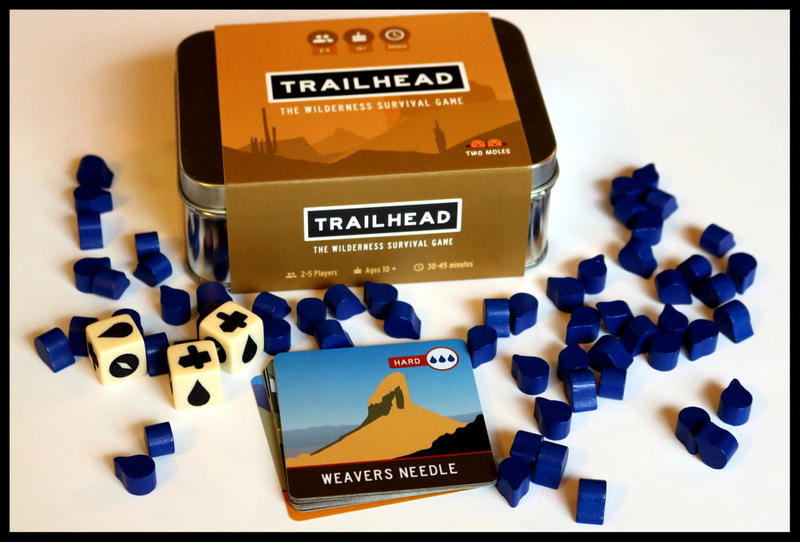 A die rolling game with a strategic twist, Trailhead is easy to learn and perfect for both the kitchen table and the campsite. 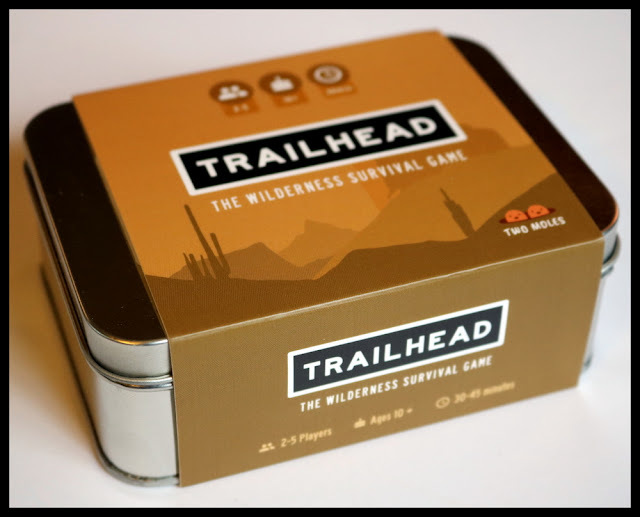 Trailhead: The Wilderness Survival Game is a wonderful little dice-rolling, resource-management, and racing game that comes packed in a very portable tin and encourages you to use items from nature as your playing pieces. The art and components help flesh out the nature-based theme, and the goal of reaching the Trailhead without running out of water is very appropriate here. I was impressed from the moment I opened Trailhead; it comes in a small silver tin with a slipcover for added protection and visual appeal. 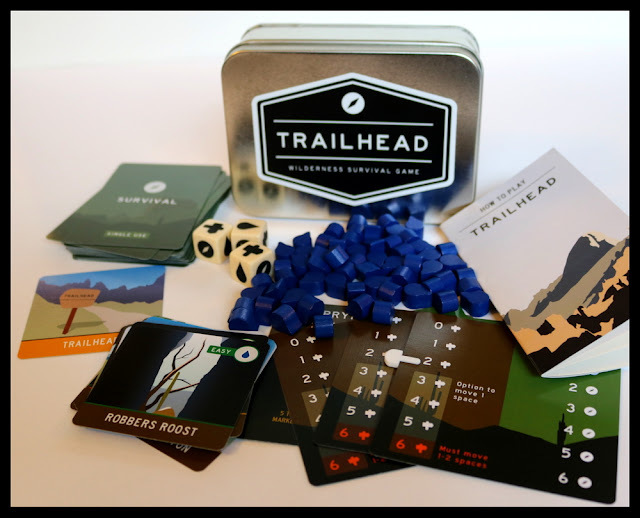 Inside the tin are the components, all carefully bagged and separated: a small deck of Map tiles, three custom Trailhead dice, 36 linen-finish Survival cards, five larger Counter cards with 10 slider clips, and a pool of 60 awesome wooden Water Drop tokens. The components are all excellent quality and fit nicely in the tin; I appreciated the fact that they came pre-bagged and sorted, too. 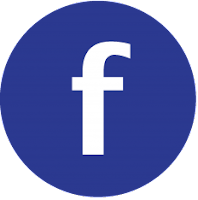 The instruction book is very clear and laid out well, moving from the big picture to the smaller details in a way that is easy to follow and understand. 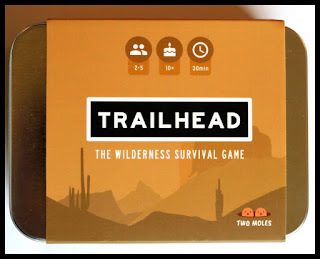 Setting up Trailhead is quick: use Map tiles are to create a trail in the center of the table, shuffle the green and gold decks of Survival cards, and give each player a Counter card, two slider clips, and eight Water Drops. 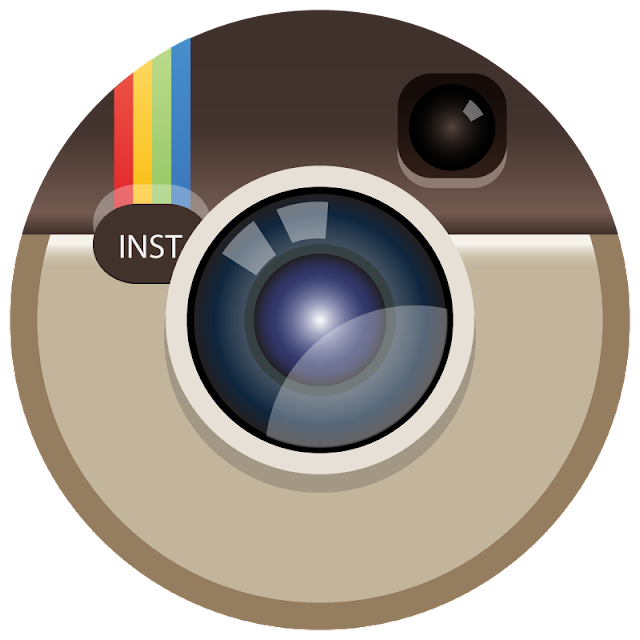 Each player should also scout around for a natural item to use as a playing piece - a rock, small pine cone, or acorn will do! Players roll the dice, and the player who rolls the most Trail Markers goes first. 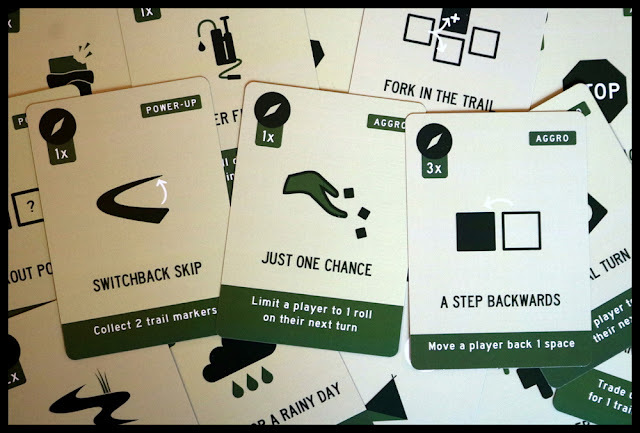 Trailhead is a racing game to see who can get to the end of the trail at the Trailhead first. 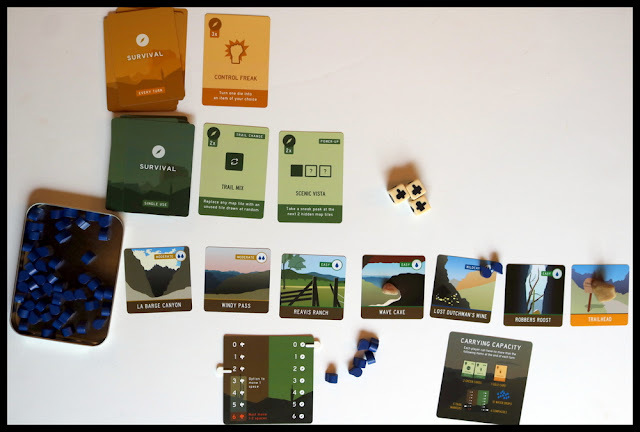 To move along the trail, you'll need to roll and accumulate Trail Markers, but at the end of each turn, you must pay Water Drops equal to the number shown on the Map tile you're on, so it's important to also use the dice to collect Water Drops. 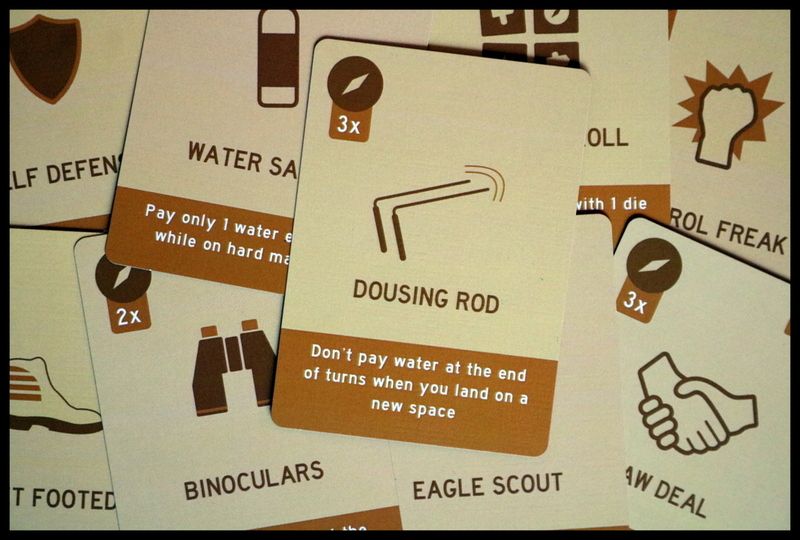 Making the balance a little easier are the Survival cards, which can be bought if you roll and save enough Compasses. On each turn, you'll roll the thematic Trailhead dice up to three times, saving what you want each time (as in Yahtzee). Then you'll collect the items you rolled - Trail Markers, Water Drops, and Compasses - and have a chance to use them to move or to buy Survival cards. 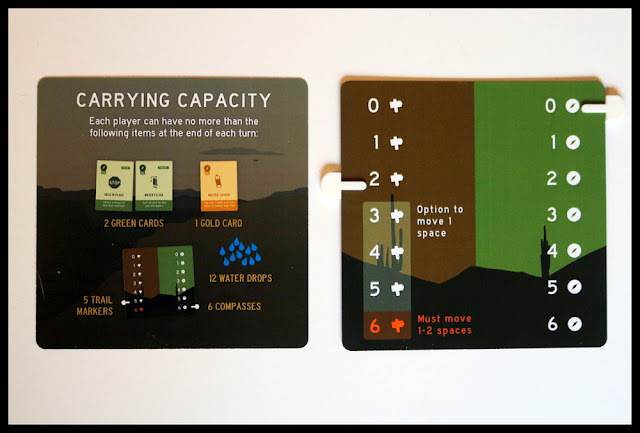 These cards will give you tools - some a one-time use, and some you can use each turn - to help you move faster and father, gain more water, give you an advantage to see the hidden Map tiles ahead, etc. 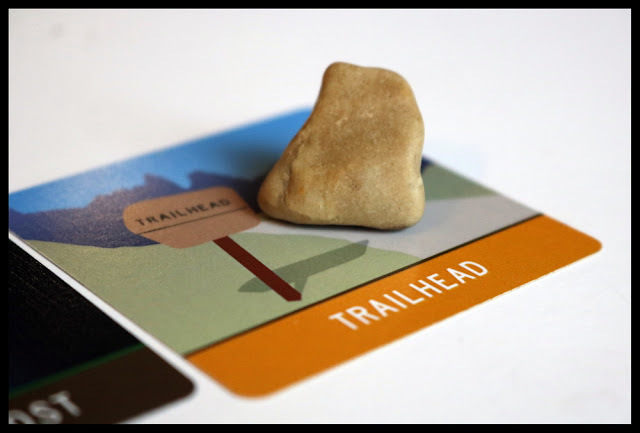 The player who does the best job of balancing their resources and rolling the dice to the greatest advantage will reach the Trailhead tile first and win the game! 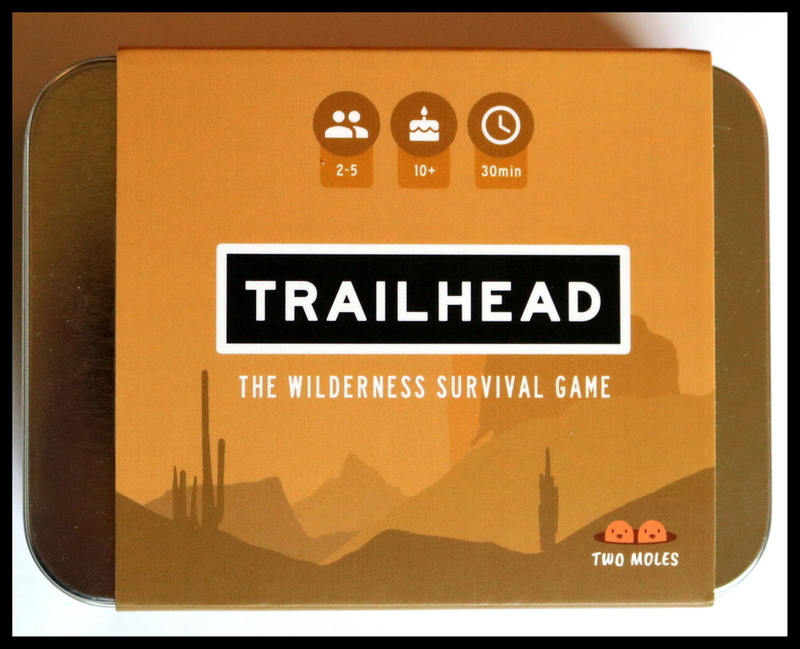 Trailhead is a superb little family game; as the back of the box says, it's perfect for the kitchen table or the campsite, thanks to its protective packaging. My family enjoyed the mechanics, as well as the artwork on the cards and the overall theme of the game. 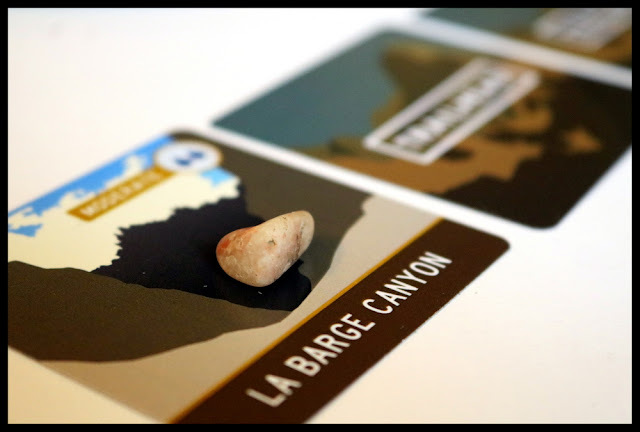 It fit well into our game-schooling lifestyle, and we used it as a jumping off point to discuss camping, hiking, survival tools, water needs, the Superstition Mountains in Arizona, and the National Forest Foundation, as well as basic ecology and conservation issues. 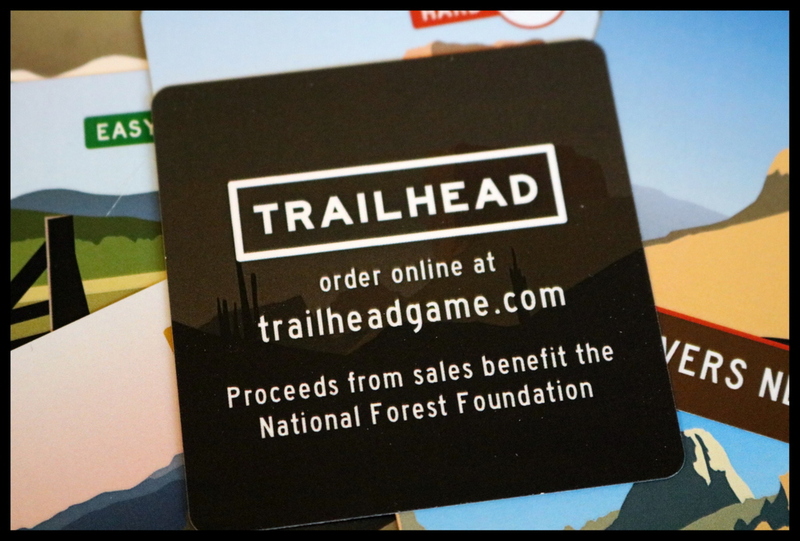 We were impressed that $1 from each sale goes to the NFF. 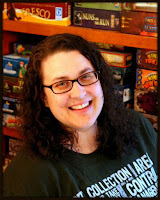 As a homeschooling mom, I love all the places that this game led our conversations! 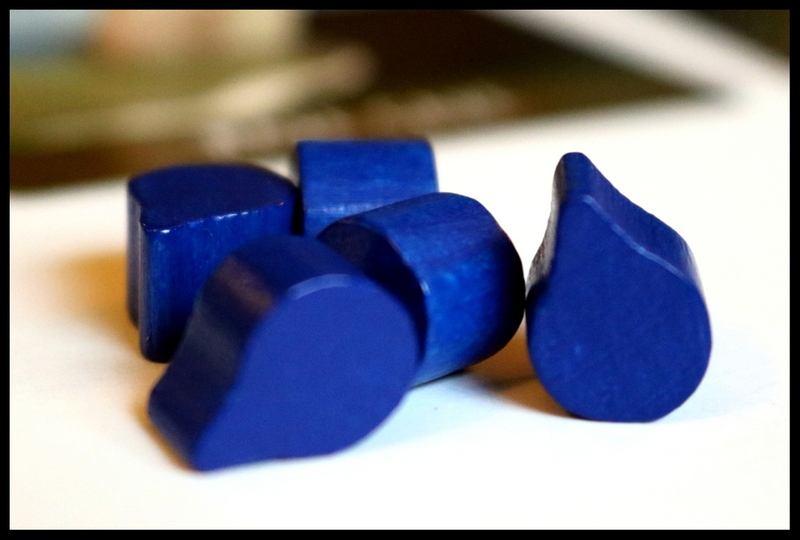 As I mentioned before, the components are very high quality, and the rulebook is incredibly well done. They made the game a joy to learn and explore. 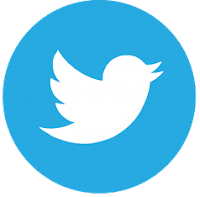 I don't have anything negative to say about Trailhead! 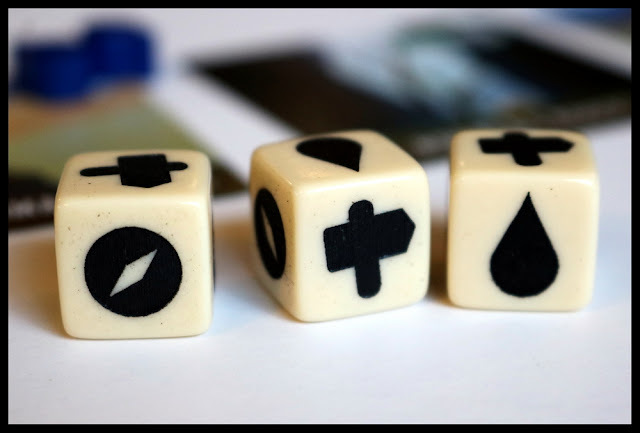 It is a lighter game, based on the luck of the dice as well as a bit of strategy, and so it may not be the perfect fit for every gamer - but that's about all the bad I have to share about this one. Families and gamers who enjoy games like King of Tokyo, Yahtzee, Machi Koro, or Pandemic: The Cure may enjoy Trailhead. In case you couldn't tell, I've been grinning the whole time I've been writing up this review: Trailhead is a gem of a game, engaging for our family to play, and inspiring in its theme. It's a lovely little dice-rolling, resource-management race with amazing components and fantastic quality throughout. It's a winner for us!